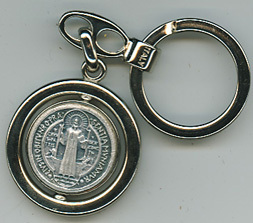 On the obverse of the medal, we see Saint Benedict holding a cross and his Rule. On his right is the poisoned cup which shattered when he made the sign of the cross over it, and on his left a raven, carrying away a loaf of poisoned bread which a jealous enemy had sent to St. Benedict. The inscription below his feet reads EX S M CASINO MDCCCLXXX; From holy Monte Cassino 1880, and around the edge EIUS IN OBITU NOSTRO PRAESENTIA MUNIAMUR;May we be protected by his presence in the hour of our death.The medal can be worn on a chain around the neck, attached to one’s rosary, kept in one’s pocket or purse, or placed in one’s car or home. 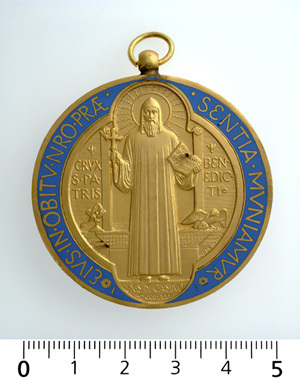 The purpose of using the medal, according to the Benedictine order, is to call down God’s blessing and protection, especially through the intercession of Saint Benedict. They call it ”a constant silent prayer and reminder to us of our dignity as followers of Christ. The medal is a prayer of exorcism against Satan, a prayer for strength in time of temptation, a prayer for peace among ourselves and among the nations of the world, a prayer that the Cross of Christ be our light and guide, a prayer of firm rejection of all that is evil, a prayer of petition that we may with Christian courage “walk in God’s ways, with the Gospel as our guide,” as St. Benedict urges us.” One is encouraged to study and meditate over the inscriptions and representations on the medal. The motif of the medal, or the medal-cross as it is often called, of Saint Benedict is frequently used on other objects than medals, i.e. 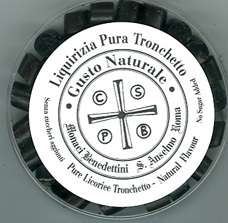 as shown here; a crucifix, a key ring and a box of liquorice lozenges. Vade retro Satana! Nunquam suade mihi vana! Sunt male quae libas. Ipse venena bibas! The first letter of each word corresponds to the inscription around the edge of the reverse of the medal. In English the text reads: Begone Satan! Never tempt me with your vanities! What you offer me is evil. Drink the poison yourself! 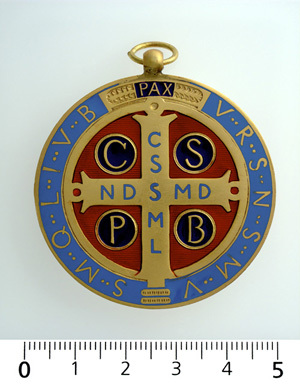 The other letter on the reverse are: CSPB, short for Crux Sancti Patris Benedicti; The Cross of Holy Father Benedict, and CSSML/NDSMD: Crux sancta sitmihi lux nunquam draco sit mihi dux; May the holy cross be my light! May the dragon never be my guide.